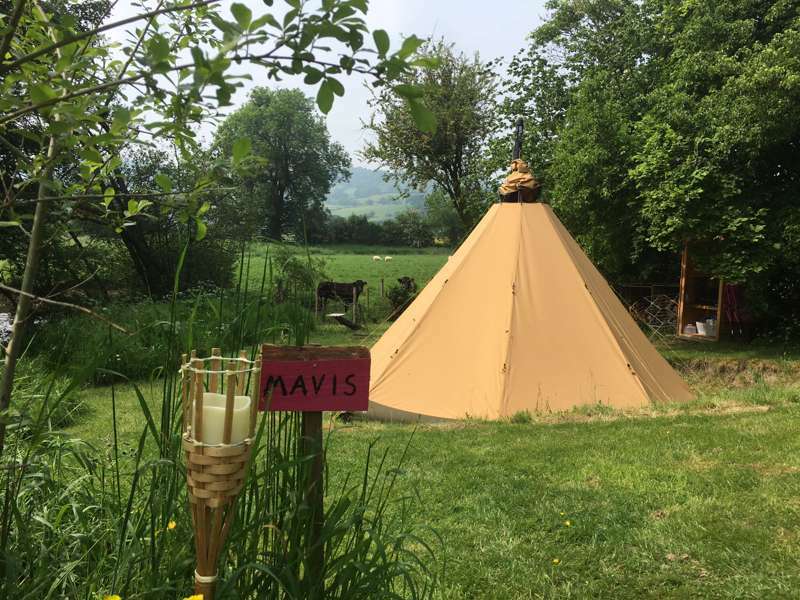 Tipis at Ponty is situated on the Powys/Shropshire borders and is a picturesque six acre small holding, with a wealth of natural beauty on the doorstep. Comprising of two luxury fully furnished Tipis, Mary and Mavis, and three grass tent pitches, Daffyd, Algie and Don Don, Adults and dogs are welcome. 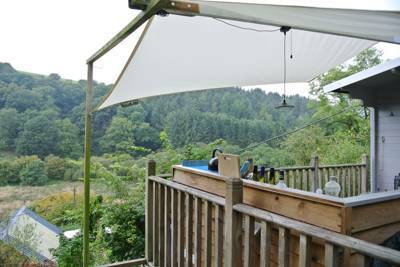 The campsite and our adjoining three acre paddock is bordered by the River Cain, for which we have fishing rights, and has beautiful views up the valley. We are a vehicle free site so provide you with wheelbarrows to transport your belongings. Our brand new site boasts two bespoke wet rooms, a kitchenette (with fridge, microwave and washing up facilities) which has a little "honesty box" shop, stocking various products prepared by chefs, Ian and Jane, who occasionally will offer themed evening meals during busy periods. 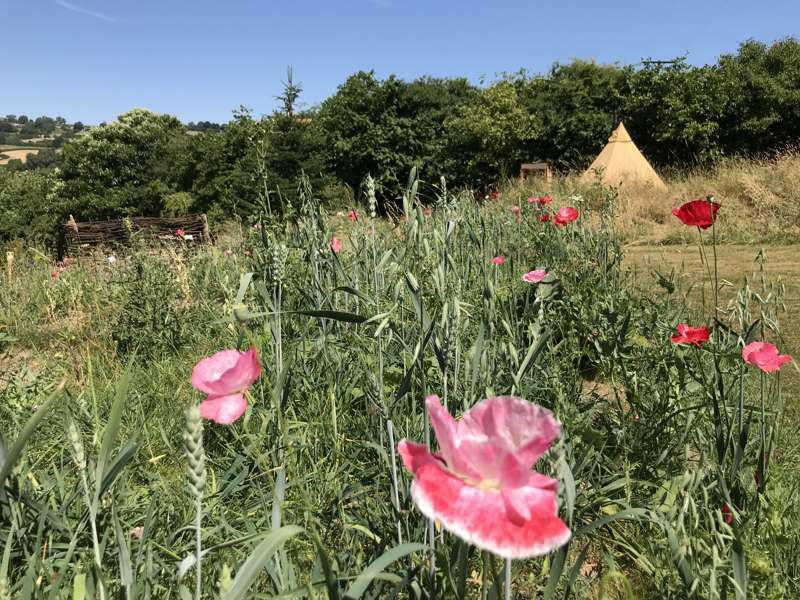 The Tipis have a fire pit, rustic seating and tailor made cooking pod with double gas hob, the tent pitches have fire baskets and rustic seating. All pitches are welcome to use The Sunset Shack in the upper copse, our purpose built funky shed which offers a cooking area with double gas hob and seating for dining/relaxing, enjoying the views and spectacular sunsets. The village of Llansantffraid is half a mile away providing two mini supermarkets, pubs, curry house, chip shop, post office and petrol station. 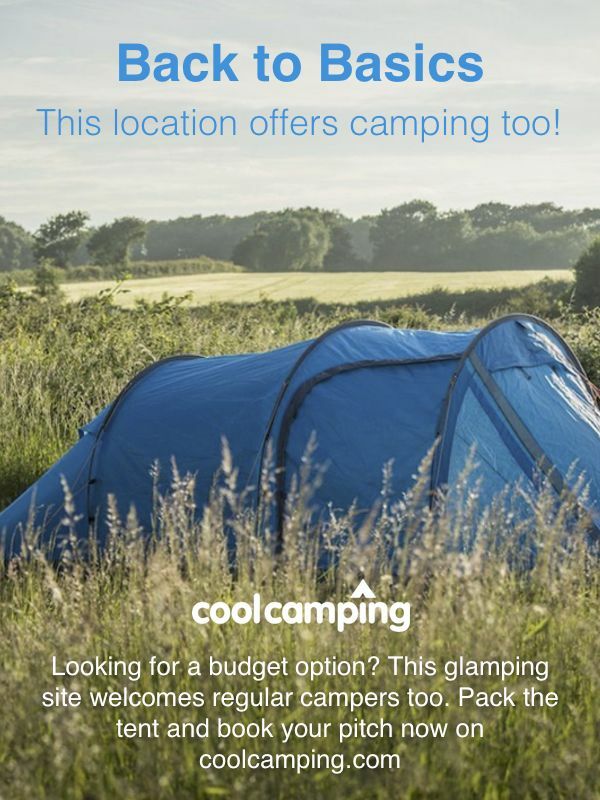 Our site is a perfect location to use as a base for cyclists, walkers, golfers, fishermen, sightseeing and retail therapy, or simply chilling on site. For latest availability and best prices for Tipis at Ponty, please use the Date Search above. 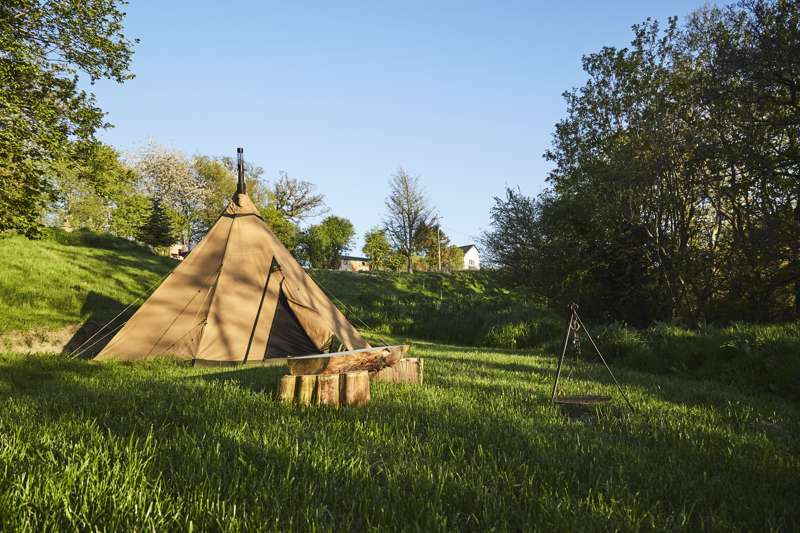 Tipis include comfortable bed with cushions and throws, a wood-burning stove and bean bags. Each comes with a bespoke cooking shack with double gas hob. Cutlery, crockery, utensils, head torches and fairy lights provided. Tent campers have use of the communal kitchenette, includes a microwave and fridge. 2 communal wet rooms available. A small on-site honesty shop stocks bare essentials and Ponty's own homemade produce with an honesty box. 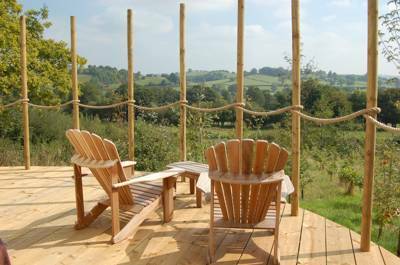 The communal area ('The Sunset Shack') in the upper copse has stunning views and can be used for informal dining, relaxation or recreation. Each pitch comes with a firepit and rustic seating. Table tennis available onsite and fishing available in the River Cain. It's just a short drive to Llanreaydr Waterfall or Pistyll Rhaeadr – among the highest waterfalls in the UK – and the stunning Lake Vyrnwyn is also nearby. There's no shortage of historic sites in the region with Powis Castle (01938 551944), Chirk Castle (01691 777701) and Whittington Castle (01691 662397) all within easy reach. There's also a wealth of outdoor activities to enjoy in the vicinity, including canoeing and both road and mountain biking. Your hosts are keen cyclists so can fill you in on all the best trails. Hosts and former chefs Ian and Jane organise the occasional pizza / BBQ evenings for guests. The on-site honesty shop is also brimming with their homemade produce. Nearby eateries include the renowned Station Grill (01691 828478), which serves traditional dishes done elegantly, such as Welsh Lamb Rump with minted peas and port and red wine sauce. For something a little spicier, The Palace (01691 828152) is a cracking Indian for dining in or takeaways. 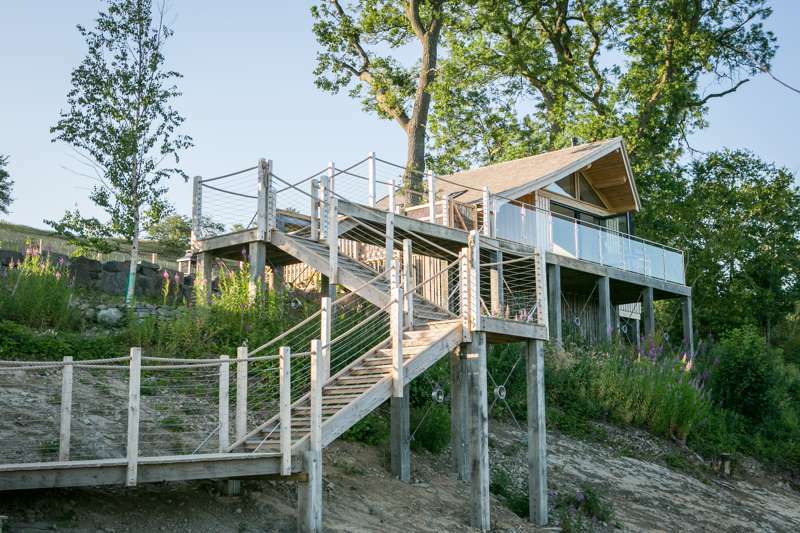 Your hosts' personal recommendation is Plas-yn-Dinas (01691 829055), a beautiful timber-beamed restaurant in Llanfechain serving a refined menu of inventive dishes like tempura battered sea bass and cider-brined pork chop. There's a chip shop and cafe nearby, plus 2 mini supermarkets in the village ½ mile away. From Llansantffraid village take B4393 signposted to Llanfyllin and Lake Vrynwy. The lane leading to Pont Y Forwyn is clearly marked , exactly ½ mile on right hand side. The site is marked by a striped post with tipis sign. Buses run through Llansantffraid, with main buses and coaches running from Oswestry. The nearest train station is Gobowen or Welshpool. 3 tent pitches and 2 tipis.